You are curenlty in Digital Electronic Muscle Stimulator With Timer And Carrying Case made by Drive Medical and asigned to category. 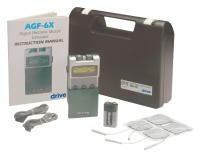 Item #AGF-6X is no longer available. Please browse our catalog for current products. You have selected Digital Electronic Muscle Stimulator With Timer And Carrying Case from T.e.n.s. Units & Supplies. We hope that this Digital Electronic Muscle Stimulator With Timer And Carrying Case made by Drive Medical is what you were looking for. If you have any questions about this particular Digital Electronic Muscle Stimulator With Timer And Carrying Case or any other products from T.e.n.s. Units & Supplies, please call us. We have an experienced staff that will gladly help pick out the correct Digital Electronic Muscle Stimulator With Timer And Carrying Case for you, also. If you are looking to make a purchase of Digital Electronic Muscle Stimulator With Timer And Carrying Case in large quantity or you are a Hospital or Medical facility and need help on making a purchase of Digital Electronic Muscle Stimulator With Timer And Carrying Case made by Drive Medical, please contact us. Electrical Muscle Stimulation (EMS)is a proven, efficient way of treating muscle injuries by the transmission of electronic pulses that causes passive exercise. The stimulation, contraction and relaxation cycle of EMS loosens muscle fibers, increases blood flow and stimulates muscle growth. Digital wave technology provides a highly efficient delivery of the wave signal. Dual isolated channels. Pulse Amplitude: 0-90mA peak to peak into 500 ohm load. Pulse frequency adjustable from 1-150 Hz. Pulse width is adjustable from 30 us ~ 260 use, 10 use/step. Contraction time is adjustable from 1-30 seconds. Relaxation time is adjustable from 1-30 seconds. Ramp time is adjustable from 1-6 seconds. Metal belt clip. Comes complete with carrying case, 2 lead wires, 9-volt battery, 1 package of 4 pre-gelled electrodes and operating manual. 3 Year Limited Warranty.